On August 8, the New York City Council decided to put the ride-hailing industry – dominated by Uber and Lyft - under watch. Counter-intuitively, one of the biggest city in the world, while appearing to put a stop, might give the new mobility services the second chance they need. On August 8, the New York City Council decided to put the ride-hailing industry under watch. New legislation, soon to be ratified by Mayor Bill de Blasio, has a twofold objective: reduce traffic congestion and improve living conditions for drivers. It aims to do so by capping for-hire vehicle licenses for one year and establishing a minimum wage for drivers. Though hailed by many drivers, this decision has been strongly criticized by Uber and Lyft, which tried (and largely failed) to mobilize their users against rules that will likely stop the so-far exponential and uninterrupted growth of one of their largest US markets. Beyond the expected halt to growth, the temporary cap in licenses raises much more fundamental questions for the future of urban mobility. First, was the status quo sustainable? Not really as it was marked by conflicting interests between the city and ride-hailing platforms. The rise of the app-based for-hire vehicle industry has been turning the taxi industry upside down and challenging city officials, who were accustomed to having control of mobility services. A recent report commissioned by the Taxi and Limousine Commission shows that about 80,000 drivers are now affiliated with the four main ride-hailing platforms, Uber, Lyft, Juno and Via — an increase from around 10,000 drivers only four years ago. The four dominant platforms facilitate about 17 million trips in New York each month — almost 600,000 rides a day and twice the number of taxi trips. The explosively growing ride-hailing industry has become a scapegoat for numerous transportation issues in New York, including the rise in congestion and—despite an increasing population—a decline in subway and bus ridership. Uber and Lyft have been targets in the sights of officials for some time; it was only a question of when they would take action. Second, will this new legislation reduce congestion? The short answer is that it won’t be sufficient. 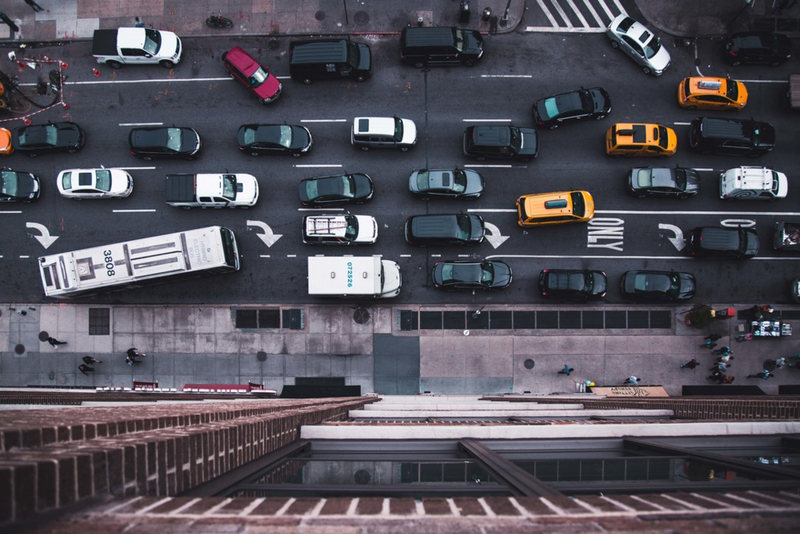 According to traffic data company INRIX, New York is the third-most congested city in the world, home to four of the 10 most congested US roads. To take an example, on 42nd street, the average speed at peak hour is 5.8 mph. Ride-hailing services have indeed made this worse. A 2017 report from former Department of Transportation official Bruce Schaller concluded that Uber, Lyft and their equivalents had worsened traffic on the city’s busiest streets. However, capping the number of vehicles will not reverse this. It will likely only focus for-hire cars on the busiest areas, at the expense of districts further from the core. This is the argument Uber has been making, and it was proven right recently in Paris, when the “Grandguillaume law”, which reduced the number of drivers by 25%, only had the effect of focusing for-hire cars on the center of Paris. Congestion pricing, as defended by Uber and envisaged by New York Governor Andrew Cuomo, appears better suited to solve traffic jams as it would also affect private cars and delivery trucks and could be differentiated across areas. Of course, congestion pricing is also more complex—technically and politically—than a 12-month moratorium on for-hire vehicle licenses. Third, what does this new legislation mean for the future of the on-demand transportation industry? Counterintuitively, this decision might give the new mobility services the second chance they need after their initial years of recklessness. If the city and ride-hailing companies can work together, this bill could mark the beginning of a sensible integration of on-demand transport into public transit schemes. The future could be one in which ride-hailing services seamlessly complement mass transit, take much more modal shares from private cars and dispatch fewer vehicles while moving more people, leveraging pooling technology. The New York City Council’s activism is the first step towards achieving this goal, and the courage of city officials to take action must be admired. Unlike many cities that have either let private actors disrupt traditional modes, or prohibited any form of innovation, New York has put itself in a position to regulate (with the licensing system) and understand (by mandating the sharing of data) the development of the nascent on-demand transport industry. Now that the industry has reached a critical size, this moment is a chance for the City Council, and residents, to reflect. In an almost apocalyptic public transportation context, with a massive need for reinvestment, heavy short term operational challenges (L line, Lincoln Tunnel…), and increasing delays, we need to thank New York officials for staying focused on the long term. Any decision affecting on-demand mobility should be made as part of a broad consideration of all modes of transport. In New York, the governance of mobility services and transport infrastructure remains fragmented between the city, state and federal governments. Some other cities are luckier: Singapore, London and Dubai are more like “city-states” with independent control over mobility policy, regulation and financing. They are contemplated as best-practices in the field of mobility. Transport for London is a great example of smart governance across modes and infrastructure with a scope of responsibilities covering mass transit, traffic management (including congestion charging), bike lanes and for-hire vehicles. Singapore even integrates transport demand management to the mix, allowing the transport authority to adapt public transit pricing according to traffic. New York should move in this direction, and in the short term, try to ensure that thinking about Uber, Lyft and their peers is part of a discussion about all transport modes, across all levels of government. New York must move from a model that favors ex-post regulation to one that fosters mutually beneficial partnerships with private players. Partnerships between Uber or Lyft and public authorities have been growing strongly in the US over the last few months. For instance, Las Vegas and Boston subsidize rides as a “paratransit” service option, and Charlotte offers discounted trips for transit pass holders to and from light-rail stops. New York could learn from cases in other US cities to build larger-scale partnerships, which will require a great amount of trust between cities and private players. The New York City Council should work with platforms to equip itself with new measurement tools, which make it possible to really understand the advantages and disadvantages of ride-hailing services beyond headlines figure that are often irrelevant. Ride-hailing services, as well as other new mobility options like free-floating vehicles—e.g., dockless electric scooters from startups Bird or Lime—should be regulated based on a full understanding of the pros and cons they bring to society in terms of sustainable access (i.e., their ability to improve travel speed between the different parts of the city at a reasonable cost, while limiting pollution). Yet, today, in-depth socio-economic analyses and comprehensive cost-benefit studies are limited to large infrastructure projects. Collaborating with cities in this way could be a great opportunity for platforms like Uber and Lyft to demonstrate their value. All eyes are now focused on New York, as the city just made a courageous move by acknowledging simultaneously the current limitations and the tremendous long-term potential of the ride-hailing industry. The stakes are high. For its own good: if the city and on-demand services can cooperate efficiently, the coming time could be an opportunity to ‘civilize’ the wild disruptors, and align what they can bring to the common good—a smart integration of public policy and new technology. In the broader context of the need to reinvest in mass transit, New York could even go as far as launching a “Mobility Summit,” extending its moratorium to all transportation decisions and building together with all mobility operators the blueprint of an integrated, multi-modal, individualized and smart mobility system. For other major cities in the world: if New York cracks the code, ride-hailing will contribute even more to the social and economic development of the city just as the subway system has always done. And the Big Apple would become a new mobility lighthouse from which others will draw inspiration.